A protocol is a set of rules. File Transfer Protocol (FTP), one of oldest Internet protocols still in widespread use, provides rules for exchanging information between computers over a network or via a modem connection. File Transfer Protocol (FTP) is the simplest way to transfer files between computers on the Internet. Hypertext Transfer Protocol (HTTP) transfers displayable Web pages and their associated files, Simple Mail Transfer Protocol (SMTP), transfers e-mail, while FTP, an application protocol, uses the Internet's TCP/IP protocols to transfer any file. FTP can be accomplished with command line interface or with a graphical user interface program. The final step in Web development is publishing. On the Web, this is far easier than in any other medium—the files are simply copied into the appropriate directory on an HTTP server. If the server is in a remote location this is most commonly accomplished using FTP. No matter how you decide to create your Web pages, you will almost certainly need to use FTP at some point to transfer your files to a Web server. FTP's basic function is to handle uploading and downloading of files. Uploading means to send a file from your local computer to a remote host computer. Downloading is the opposite, to bring a file down from the remote computer to your computer. To use FTP, the user must know the location of the desired files or directories, including the host and path names. The FTP user must specify the address of the server, either its domain name or IP number, and must correctly configure the application used. If access to the remote server is controlled it may also be necessary to submit a user name and a password. Most FTP transfers are made using special software applications. An FTP Client is software designed to transfer files between two computers over the Internet. Several applications are available to students and academic users at no cost. These can be downloaded via Internet browsers. Recent versions of Web page creation tools often include a publish command. This feature automates FTP publication. The user must, of course, configure the software with the appropriate address for the upload, and, where applicable, user name and password. Make sure you have the information you need to publish your page, including the name of the server, your user name and your password. Call your Provider or system administrator if you need this data. Connect to the Internet and open the page you want to publish in the Netscape Composer window. Configure the Composer, Publish preferences. Click the Publish button on the Composer toolbar or select File, Publish. The Publish Page dialog box will appear. In the 'Location to publish to' text box the address of the server you entered in Preferences appears. Type your password in the Password text box, and, in the User Name text box, type the user name for your account. Click the Files associated with this page radio button to include any image files your Web page uses or click the All files in the page's folder radio button to include all the pages and images in that folder. Then click OK. Double check your site online using a browser. You can use FTP with your Web browser, simply by entering the URL of the ftp site. However, there are specialized programs for transferring files. Here are two popular application which can be downloaded online. FETCH is a Macintosh FTP application. Fetch allows point-and-click, drag and drop file transfers to and from any machine with an FTP server, over a TCP/IP network. Fetch is free to users affiliated with an educational institution or charitable non-profit organization. Other users may purchase a license. Fetch comes with a set of bookmarks for useful Mac FTP sites. WS_FTP, the Ipswitch software, is a popular Windows FTP application. WS_FTP LE is free for academic use to students, faculty and staff at educational institutions. To download the program click on the button above, select the "Download WS_FTP LE" radio button and click download. When you run the installer for WS_FTP LE you will be prompted for some information. You need to answer the questions or the software will not install. WS_FTP LE is only free for use while you are at college. It is not licensed for commercial use. When asked if you are a member of an education institution, click the button next to "A student....educational institution..." When asked how you will use WS_FTP LE, check the box on the right which says "For academic work". Make these selections only if they are in fact true. Your rights to use the program expire when these facts no longer prevail. I will use WS_FTP to illustrate how an FTP application is used. WS_FTP divides its screen vertically into two, not unlike Windows Explorer. On the left is the local drive and on the right is the remote server. Each side has two windows, the top window displays the directory tree and the bottom window shows the files in the current directory. Buttons allow the user to transfer selected files with the click of a mouse. After installing WS_FTP LE on your hard drive, launch the application. 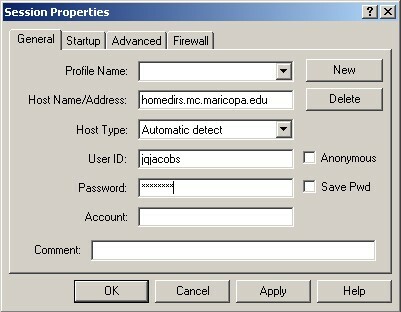 The first window to appear will be the Session Properties dialog box, where you enter information about the server you will connect to, and your user name and your password if required. In the following example I am connecting to my MCC Web site. Click on the links below for further directions. Next Reading: Directions for Using WS_FTP. FTP Explorer is an FTP client with an Windows Explorer-like interface. It supports multiple simultaneous transfers, resumption of interrupted downloads, directory caching, command queueing, and more. It is also free for personal and educational use.